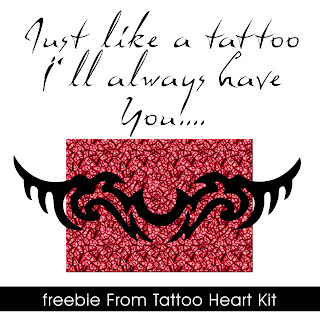 BusyScrappin: FREEBIE from new Kit in the store called tattoo heart..
FREEBIE from new Kit in the store called tattoo heart..
Sunday and Monday I havent been to bed yet...*lol*Click on photo for link. TY so very much for this AWESOME WA!!!!! You also gave me a FANTASTIC idea for one of the pages in my Hubbies album!!! You see he died in the Line of duty in FEB 01 while performing his duties as Chief Engineer!!! I've since retired as a firefighter and had always wanted a tattoo so about a year after his death I went & got one on my right leg just above the ankle!!!! Its a cross with a purple rose & his name under it so now I'll have to take a picture of it & use this!!!!!!!!! !